I've been gone for a while. I suppose that's one of the hazards of being a writer and not a blogger. Ah well, such is the stuff of life. My last few months have been spent completing a work I co-authored under my given name with my friend and colleague, James Essig. It is a foray into the world of relativistic rocketry... extreme relativistic rocketry. It is, I suppose, a subject that will interest few, but those it does may well hold the hope for the long term destiny of man... or at least the hope for mankind's ultimate survival. No, the end is not near. At least I hope it isn't... but eventually planet Earth will die. It could happen in any number of ways, but barring a major asteroid strike, a collapse of our magnetic field, or a comet smashing into us, Earth should be around for a few billion years yet. So, not a concern, right? For this, and a few generations to come, perhaps, but forward thinkers all agree that the best hope for the long term survival of our species lies in exploring the universe and finding habitable planets elsewhere. If we don't, then eventually humans will be toast... literally. At some point in the future our sun is going to die. When stars die, they don't just go out like a light bulb... well, maybe like an incandescent one where its death is preceded by a last flash of energy. This will be caused by the rather sudden expansion of its outer layers as the sun's fuel is depleted. That will be accompanied by a contraction of the core. This is usually termed the "red giant" phase... and it will overtake the inner planets (remember we are the third rock from the sun) and fry them. If we're still here... well, adios amigo. But that isn't the only reason people think about space and traveling the cosmos. There is something more basic, more primal in humans that drives us to look beyond ourselves and our confines. The urge to explore... to see what's over that next hill. The universe is a huge hill and we have not even scratched the surface. The stars you see every night may, or may not, actually be there. It takes their light millions, even billions of years to reach us, so what you are looking at in the night sky is the past. 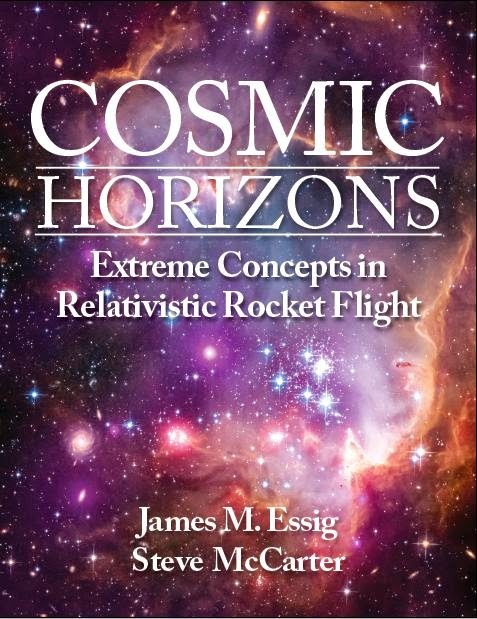 In this book, we consider extreme configurations, including spacecraft built of theoretical bulk materials - those that are extremely dense - and some pretty exotic rocket fuels, like matter and antimatter (hey, even NASA is playing with that idea). The idea is to lay out some possible road maps on how to get from Earth orbit to billions of light-years distant in a very short time (from the spaceship's perspective). We take a tour of current and near term technologies, and then extrapolate to the possible. We discuss crew survivability and considerations for spaceship design. It's been quite a trip writing the book. Look for it on Amazon in both hard copy and Kindle sometime in the next month or so, and explore Cosmic Horizons with us, won't you?